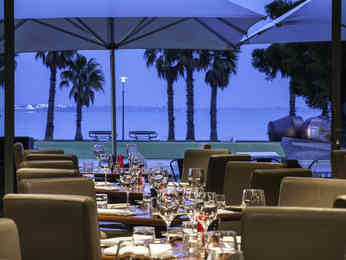 Situated on Geelong's vibrant waterfront precinct with amazing views and alfresco area, the restaurant serves delicious cuisine featuring local produce and seasonal specials complemented by local wines. Restaurant available for private functions. The breakfast buffet is fabulous! Arrived early and appreciated lounge area prior to dining in restaurant. Ideal setting for celebrating Silver Anniversary. The only criticism was when we were eating breakfast the restaurant only had one other table (a couple) sitting near the window, and us in it. A family came in consisting of extremely noisy children x 5 and in turn noisy parents x 5. This group was sat directly behind us. The waitress had the whole restaurant to seat them away from us. Instead of a leisurely breakfast we rushed through as the noise was unacceptable from that group with their children. Was not happy at all it ruined our breakfast and that group should have been seated away from others as they were loud, rude and disruptive. Service a bit hit and miss. I think we had a trainee? We were disappointed that there wasn’t more seafood selection....most of the food didn’t appeal to us....we ate very little....the delightful birthday desert presentation was wonderful and very pleasant surprise from the Waterfront Restaurant, thank you. We booked online in a seamless and easy to use system. We (2) decided on the chef's special on the day Red Thai curry snapper on a bed of rice noodles and sweet potato. It was surprisingly bland and needed seasoning. The fish itself seemed firm and needed a good knife to cut. The broccoli beans and sweet potato were under cooked and firm. It was a challenge to  pierce the veg on to the fork without catapulting it across the table. The red curry sauce was runny and excessive and posed a threat to flicking on to your clothes. We pressed on for a desert of terrine chocolate and macerated cherry. Frozen solid and served with just as spoon, I challenge anyone to ease away any pieces to eat without the risk of the rock solid terrine launching itself across the table as a guest for a celebration I didn't complain. A few simple things would greatly improve the diner experience. 5 star service & very good food in the restaurant which I will be back again in the future. We loved our dining experience at Waterfront Reataurant. The dining room is very welcoming and has a lovely atmosphere. The view of the waterfront is just amazing, and the food and service were excellent. Also, the breakfast the next morning was one of the best offerings I have experienced anywhere in the world. The staff were attentive, very friendly and professional. I couldn’t recommend Waterfront Restaurant highly enough. Thank you for a truly memorable experience! We will definitely be back again in the future. Joey and his staff were exceptional he was very accommodating and the staff couldn’t have been any friendlier. Food was very nice and the sea views great. We had a nice time and a good meal but it was disappointing to realise when we got home that our Accor Plus discount had not be assigned despite booking through Accor Plus online and showing the card. Food excellent. One staff member seemed to be doing all the tasks. 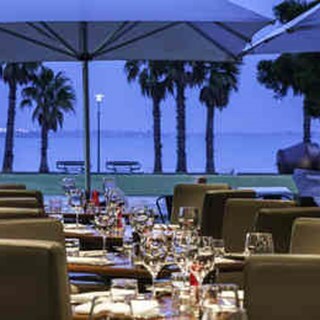 Accor plus full discount not given at this restaurant only 10% off food only. It was sometimes difficult to get the attention of staff in order to get service. We chose your Restaurant to entertain our guests, and were not disappointed. We were all impressed with the quality of the food, the service and the relaxed atmosphere - Thank you. We arrived at approximately 1:15pm, the majority of the buffets were empty and not replenished by the staff. I've been to many Novtel's throughout the world and this is by far a long way short and the WORST of all Novtel's I've been to in regards to quality of food,  selection of food and quality of service provided. I made this booking and was nothing short of being totally embarrassed for my guest. I do not expect a refund, however, I would like a formal written reply from Novel management to assess my options further. Dinner - we asked for a table near window cos it was empty and was told it's reserved. No one came to the empty table the whole night. Very slow service and waited long to order and food to arrive. However dinner was delicious and the lady who waitered for us was friendly and kept apologising for the delay. Breakfast - first waiter showed us the way and made us sit in a table near the window. While we were eating another waiter came and asked us to move cos apparently the table we were sitting is only allowed for couples. I was there with my husband and our 4 year old son. I was truly upset by it but I moved cos I didn't want to argue in front of my son. Food was good and had a good selection. The second waiter (Jade was her name I think) was extremely rude and the place was half empty and there was no reason why she couldn't just let us be in the table we were at first. Food and location were great but it was a let down for us by poor customer service.